Heather joined our Krusade three years ago as an Art Therapy Volunteer and is transitioning into her role as our Art Therapy Program Coordinator. 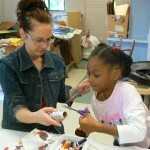 Heather is a hands-on volunteer, who takes a personalized approach to assisting the children with their projects. She takes a genuine interest in the students, parents, volunteers and their experiences. She has volunteered at art therapy classes, the Creekside Festival Art Tent and Music II Miracles: Evening of Jazz. Heather works for the Public Defender’s Office and is currently pursuing a Masters Degree in Art Therapy. She enjoys working out, painting and has recently taken up motorcycle lessons. What have you gained from your experience as a Kya’s Krusade volunteer? I have gained a strong appreciation and empathy for people with disabilities and the parents of these children. There is such a strength and strong character that everyone has that I am humbled every time I’m with the group. The group has been a great reminder of what it is that I really want to do with my life, use art to help others manage through challenging times. It was during one Art Therapy class when everyone came together (parents as well) to support a new mother and her son. The child was exhibiting behaviors our group was not familiar with and the mother appeared overwhelmed by her son’s behavior. No one seemed confused or at odds during class or afterwards in the parking lot. Everyone rallied together to keep the child safe and help comfort his mom in this distressing moment. I thought it was beautiful. Our favorite memory of Heather as a volunteer? Heather’s second year as an Art Therapy Volunteer, she was seated next to one of the mothers. As they began working on the project, she asked the mother questions and they engaged in a candid discussion about her experiences as a parent of a child with physical disabilities, the little girl’s disability, surgeries and therapies and her general journey. She conveyed a non-invasive compassion for this family and a genuine interest in broadening her perspective on children and families affected by disabilities; even acknowledging to the mother her previously limited exposure to people with disabilities. They conversed throughout the class and a little after it was over. It was apparent they both really appreciated the conversation. Their interaction was such a heartwarming experience, we asked her to serve as our Art Therapy Program Coordinator. We appreciate Heather’s constant support and commitment to our Krusade and look forward to continuing to work with her!